As you approach the Topp Racing transporter in the Porsche GT3 Cup Challenge USA by Yokohama paddock, you see him. He’s usually sitting on the team’s tire cart, the same one that transports the Yokohama racing slicks between the transporter and the Yokohama Tire Center or pulls the team’s timing stand to and from pit road. Sometimes, he’s hanging from the rear of the transporter. 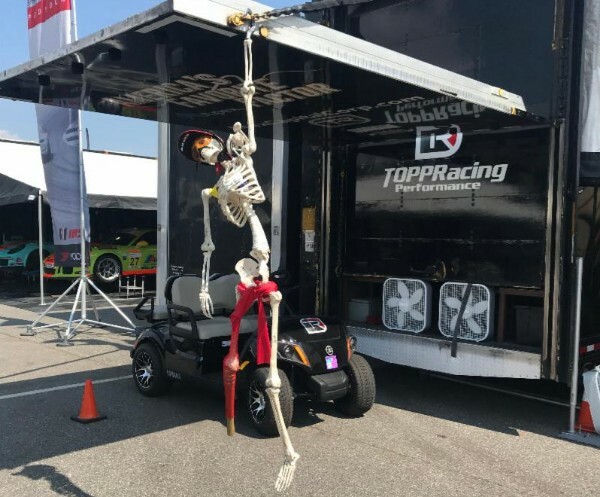 He’s the plastic skeleton known as “Billy Bones.” And he’s one of many reasons why things run a little differently around Topp Racing than they might with other teams in the IMSA paddock. “I do let the guys have a lot of fun,” says Topp Racing Founder/President Todd Oppermann. “We try to find a place where we can do go-karting at the events with the crew and the drivers. We kind of have a little inner-team competition. We have our meals together and we generally do stuff together all the time. The team’s trio of drivers – David Baker, Bill Smith and Frank Raso – get along great, and have bought into the fun environment within the team. All three are Masters level, which in GT3 Cup Challenge USA parlance means they’re over the age of 45, and their success in their chosen professions has made it possible for them to go racing. And if you’re going to go racing with this team, you’d better be prepared to have fun. Laughter and friendship are cornerstones within the team. But, as Smith points out, they’re ready when it’s time to get serious. “Racing is one thing that you really have to stay focused on,” says Smith, who drives the No. 42 Kung Fu Saloon Porsche in the Gold Cup class. Smith is an investor in the small chain of Kung Fu Saloons in Texas and Nashville. “It’s not unlike a lot of things that I’ve done in my life. Topp Racing isn’t just a tight-knit group within its own transporter and paddock space. The drivers truly care about those they’re competing against throughout the GT3 Cup Challenge USA series. That brings up another interesting point about the GT3 Cup Challenge USA series. Many of the younger drivers competing in this year’s series – such as Trenton Estep, Roman De Angelis, Max Root and David Kolkmann – are hoping to use it as a launchpad for a career in professional racing. It’s a different story for the Topp Racing teammates. “I don’t think any of us are planning to launch a professional racing career at this point in time, but we are all competitive,” Smith says. “We want to do well. I don’t have any grand illusions of a pro racing career, obviously, but I want to do as well as I can and I want to be competitive with the people I’m racing against. That’s also why it’s not uncommon to see the Topp Racing drivers hugging each other and other drivers after they climb out of their cars following a race. And when one of them does well – like Baker’s win last weekend in Sonoma or his 2017 Platinum Masters championship – it’s quite a celebration. Oppermann estimates he’s worked with Baker for nearly 15 years and feels fortunate that other clients – like Smith and Raso – have largely found him. There’s room for more at Topp Racing, Oppermann says. 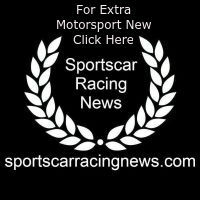 And Smith encourages anybody who has the means to consider the GT3 Cup Challenge USA series. “I think it’s the pinnacle of this type of racing,” Smith says. “When you see the guys l mentioned like Jesse and Corey and those guys that go through this series – in fact, the Porsche guys were telling me that these GT3 Cup cars are not easy to drive. If you can drive them successfully, then you can move up into GT3 Rs or RSRs or other cars pretty well. And you can also have a mascot like “Billy Bones,” whose origins none of the drivers seemed to know. They put it back on their Topp Racing crewmembers.